Cover art for the vinyl LP I'm Leavin'. Some 45 years after it was recorded by Elvis, the beautiful song "I'm Leavin'" by Michael Jarret is the title of an album. It was released on 12" vinyl for record store day last year, a compilation bringing together "the very best recordings of Elvis Presley’s work in the Folk and Country genres from 1966-1973." In honor of Michael Jarret's birthday a few days ago, I played the album and was reminded once more of the haunting quality of the title song. In fact, I enjoyed the whole album, especially the A side where five of the six tracks are contemporary pop-folk songs recorded by Elvis in 1971. On side B, only one of the songs is from that category. 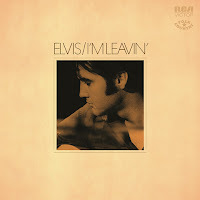 Listening to the LP I started to think of Elvis' lost 1971 folk music album. Certainly not the first fan to write about it, this concept would have been a great idea after Elvis Country. After all, when Elvis arrived at RCA's Studio B in Nashville on March 15, 1971, he brought with him folk oriented material that he had enjoyed from Peter, Paul and Mary's work, like "The First Time Ever I Saw Your Face," "Early Mornin' Rain" and "(That's What You Get) For Lovin' Me." Who knows what directions that session might have taken, had Elvis not been forced to cut it short due to suffering from a painful case of glaucoma, ending up in hospital. Anyway, here is my shot at an Elvis folk themed album that could have been released at the time, where I have substituted the songs featured on I'm Leavin' that are not recorded in 1971 with recordings from that particular year. I have included "Amazing Grace" as it had recently been a hit for folksinger Judy Collins when Elvis recorded it. Otherwise my track listing has a lot of common with both Piers Beagley´s Elvis: In The Early Morning Rain (2008) and George Smith's Elvis Presley: Exodus (2011). I especially like the prologue on the latter one, featuring the informal recording of "I Shall Be Released." But back to reality and the I'm Leavin' 12" vinyl released in 2016. An album with that title has been long overdue and I'm happy for Michael Jarrett's sake. He deserves the credit. This record has been on my list for awhile, simply because, like you, I am glad to see the concept finally come to light in some form. I'll have to pick it up soon! Great post.